It seems like I've been on the hunt forever to find a new cosmetic bag to take with me on weekend getaways and vacations. I've had the same atrocious shiny purple hanging cosmetic roll for years now and for some reason it has yet to be replaced. Definitely when I head to Hawaii in November one of these adorable pouches will be coming along with me. 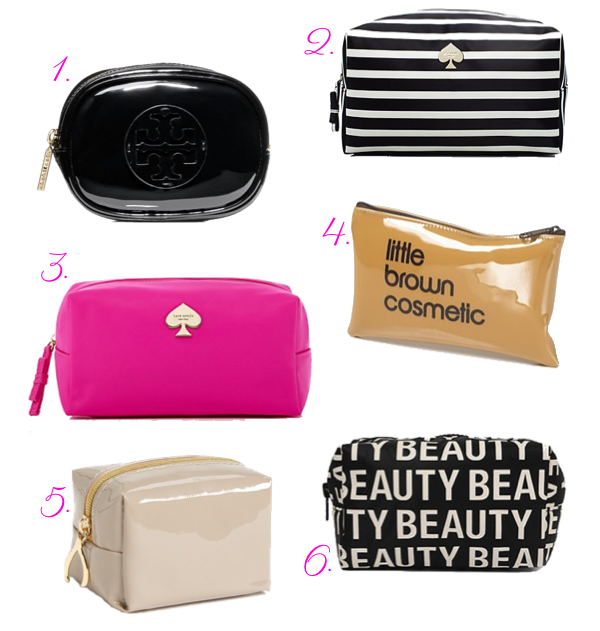 I'm loving the simplicity of these six, especially the pop of pink Kate Spade case and the oh so cute 'little brown cosmetic' Bloomingdales pouch! So glad to see you blogging again! Loving the wishbone zipper-pull on #5.